This video shows some of the entertainment organised by the Aitutaki community on Rarotonga to fundraise for cyclone Pat victims. We had great weather and a large number of tourists and locals turned out in support. The fundraising is going very well with overseas Cook Islanders also doing a great job to help the families back home. There was some controversy about the Aitutaki Sharks rugby league boys coming to Raro for their game against the Ngatangiia Sea Eagles. Some people – on Rarotonga at least – thought they should have stayed at home and got on with the repairs. Well they’ve all been working flat out since the cyclone and the boys themselves said Aitutaki is sports mad and they were doing it to raise morale. In the end it was a close match but the Sea Eagles won and all the gate takings were donated to the fund, over $1000, so it was a good day’s work anyway. Back on the island repairs are going well, roads are clear, electricity and water are under control and most of the tourist accommodation is up and running. 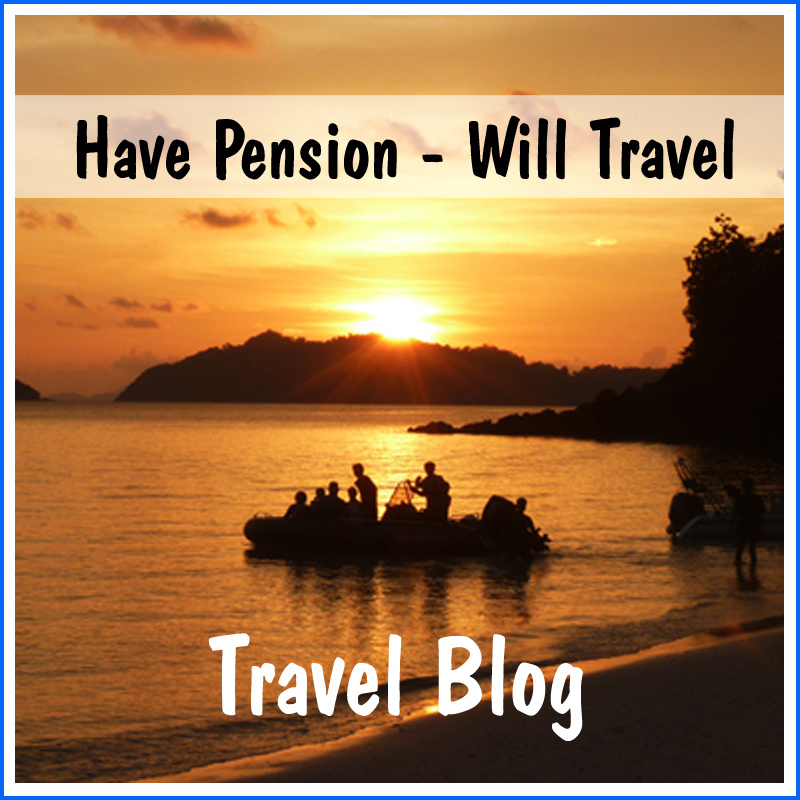 Tourists are needed to pump money back into the economy. Meanwhile a cyclone Sarah, has been hovering around the region. 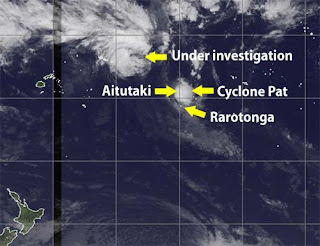 Winds caused damage in Penrhyn and it’s above Palmerston, moving very slowly, and Aitutaki is on the edges of the wind and rain and is getting more very bad weather. It’s a worry for the people who have been housed in tents while their homes are being repaired but plans have been made to get everyone under cover if things get worse although it seems to be fading away. On top of all that, the Pacific also had a tsunami warning this morning because of a major earthquake in Chile. Generally speaking our islands are very small compared to the wavelength of tsunami waves so we don’t get the massive walls of water - it goes around us rather than over the top. But we could still get flooding of low lying areas. The main complaint was that nobody seemed to know what was going on. Well, this time it was much better organised. Warning sirens went off in the early hours of the morning in the places that have them (Arorangi!) and people went around the island getting everyone to move inland or uphill. The RNZAF Hercules had been on the airport tarmac but it took off and circled the island until the danger was over. I live up a hill so I slept through the whole thing. First I knew about it was getting up to let the dog in and seeing a bunch of people on the next hillside sheltering under a marquee and looking cold and wet. They headed back to cars and trucks and drove off a short while later. Must have been tourists. Town was very quiet and some shops were boarded up this morning but once again Rarotonga has been very lucky. Cyclone Pat caused massive damage to houses, crops and infrastructure on Aitutaki but the relief effort is well underway. International aid is flowing in from various countries and organisations such as the Red Cross. The New Zealand defence force flew in supplies and personnel on an air force Hercules. The Herc ferried several loads of equipment to Aitutaki and left a team of army engineers there before heading off to help Tonga with the aftermath of cyclone Rene. Meanwhile local fundraising has started on several outer islands as well as Rarotonga. On Friday a food day at Te Atukura drew large crowds. Several villages combined to provide the food and while chicken curry, chop suey and other local favourites were being set up drummers and singers entertained the hungry throng and t-shirts sales, drinks and spin-the-wheel raffles kept everyone entertained. The fundraiser was a huge success as was the radiothon also held on Friday which will have brought in over $70,000 when all pledges are redeemed. This video is from the food day. Meanwhile the fundraising continued on Saturday with entertainment at Punanga Nui market organised by the Aitutaki community. The next video will show some of that. For detailed news from Aitutaki check the Cook Islands News website here. You could be excused for not realising that 2 February is World Wetlands Day because there are an awful lot of ‘world days’ and this is one of the more recent ones (the first was in 1997). The word ‘wetlands’ brings to mind mangrove swamps and bogs and we have neither of these in the Cook Islands but apparently on various southern group islands we do have freshwater lakes, swamps and marshes, mountain streams and also one tidal salt marsh. The latter is at Ngatangiia so to mark the day I decided to pay a visit. Ngatangiia Harbour is a natural harbour on the east coast of Rarotonga, with extensive intertidal silt and sand flats and the estuaries of two streams, Avana Stream (the largest stream on Rarotonga) and Turangi Stream. The muddy delta of Avana Stream filled much of the harbour after forest clearance early in the century. 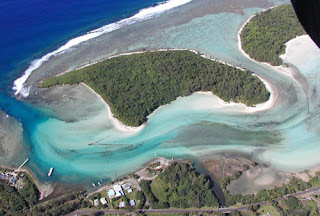 The shallow grassy marshes which occur in the intertidal zone around the harbour are the only saline marshes in the Cook Islands (bottom right in the photograph). Ngatangiia harbour showing intertidal salt marsh at bottom right. There has been extensive dredging in the harbour north of the Avana Stream mouth, and the lagoon is reported to be considerably degraded. Birds such as the reef heron and the wandering tattler (in the video) feed in the area on small crustacea and a large number of fiddler crabs make their home there. They feed outside their burrows when the tide uncovers ground during daylight hours. Waving displays, combat, and courtship usually occur for 2 or 3 days around spring tide. The large females usually build chimneys at this time and males approach the chimneys (sometimes waving). Male combat is ritualised and does not involve injury. Well, you can certainly see the waving and combat but I think it was a bit too early for the chimneys. A photograph in the CI Biodiversity Database shows they can be quite tall so it must take a while to build them. The wandering tattlers are summer visitor. They breed in Alaska and then fly down here and stay from September until about April. You can often see them feeding along the shoreline on the island’s beaches. This small area of the Avana lagoon is the only tidal salt marsh in the entire Cook Islands and since it’s under water at high tide it should all be Crown land so not available for reclamation and building but the area seems to have shrunk over the last twenty-five years or so. It is probably an important breeding and nursery area for certain marine and freshwater species so let’s hope it can survive and help us do the same.